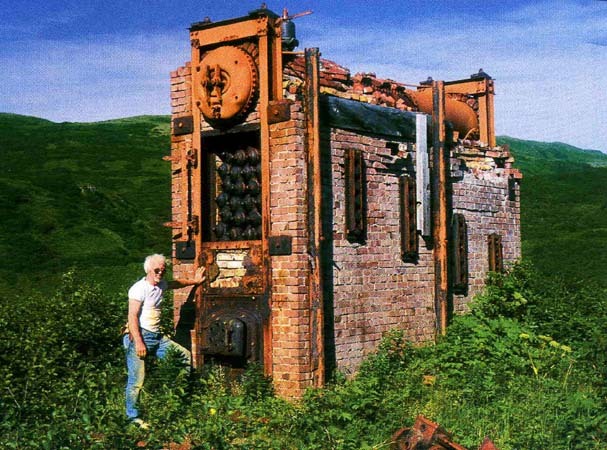 Alaska \ Apollo Consolidated Mining Co.
F rom around 1891-1917, the Apollo Consolidated Mine operated a narrow gauge railroad to gold mines at Apollo mountain on Unga Island, just South of the Alaska Peninsula. The railroad was 30″ gauge and may have used horses prior to 1897. In that year, the company bought an 0-6-0 Baldwin steam locomotive. Labor shortages during WWI and a decrease in easily-extracted gold caused trouble for the mine, but the railroad reportedly remained operating until 1917. In 1914 the Delarof Development Co planned to build a cyanide plant at the tailings pile to extract metals missed by earlier milling technology. According to the Baldwin Company records, the Apollo locomotive was built for Miller, Sloss & Scott, a San Francisco steel and hardware dealer. The specification sheet notes that the locomotive was destined for Alaska and was named “Apollo”. The gauge was 2’6″, fuel was soft coal, and water was in 300gal side tanks, with no tender. The engine had 9″ diameter cylinders with 14″ stroke, the boiler pressure was 160psi. The paint scheme was to be olive green and aluminum, with “A.C.M. Co” marked on the tank, and possibly a helmet logo. The specification mentioned a grade of 230ft per mile (a 4.4% grade) and the manufacturer guaranteed a 33 ton load uphill at this number. (From Baldwin Locomotive Works Engine Specification No 4005, Engine Class 6-11D, No 18, 2/25/1897). A photo of the locomotive can be found in Howard Clifford’s Rails North. The fuel was probably local coal, which was abundant on Unga Island (In some places the coal veins are exposed on the surface). Some sources indicate that Unga coal was a low-grade product and not cost effective to ship outside. Local mines seem to have closed by the 1930s, when this paper indicates that coal was imported to the island from Idaho. A mineral survey from July of 1893 shows a “railroad to landing” running down Salmon Creek towards Delarof Harbor. Also shown is a “Railroad to mill”, which appears to have been a smaller gauge ore cart track. This photo shows the ore cart tracks and a siding behind the mill. In this photo, there appears to be an incline on the right behind the mill which matches the location of the ore cart tracks. The survey labels a building at the top of the incline as “hoisting works”. The Apollo and Sitka mines were less than a mile from tidewater at Delarof Harbor, but the back part of the harbor is very shallow and a poor location for a port. Some sources mention the town of Unga as the rail terminus, but this may refer to a planned connection that was never finished. Most sources agree that the mine’s wharf and railway terminus were at the head of Delarof Harbor and only accessible at high tide. Freight was mentioned as costing $17-$20/ton on commercial ships from Seattle and $6/ton going South. The high rates were probably due in part to the time required to wait for a tide and shuttle supplies back and forth on smaller boats. If chartered ships were used, the rate was around $5/ton coming North and $3/ton South. It is possible that the company planned to extend the railroad into the town of Unga and use or expand the existing Alaska Codfish Company dock. One articlefrom 1889 describes another option, stating that a tramway 12 miles long was planned to cross the island to another harbor, probably the Choumagin Mine site at Baralof Bay. 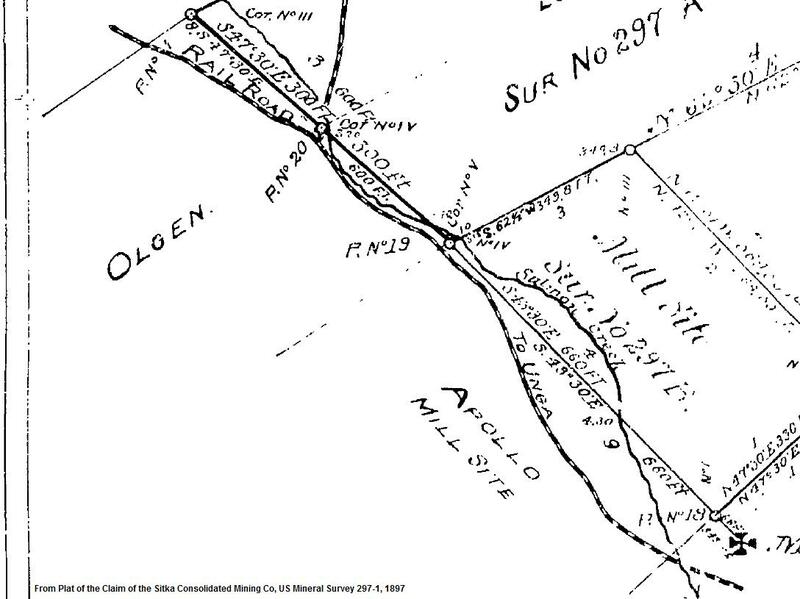 This mine also had a “railroad” ½ mile long as noted on an 1897 survey (another map calls it a “tramroad”). A modern dirt road follows the Choumagin grade, continues across to the Apollo mine, and then leads back down to tidewater at the former Apollo dock. Modern aerial imagery from the Alaska Shorezone Project shows some rails, flywheels, boilers, winches, and other rusting debris along the shoreline where Salmon Creek joins Delarof Harbor. The rails appear to have run along the shore towards the mouth of the creek and then out to a wharf, but there are no pilings or other wharf remains visible from the air. The locomotive was later salvaged and has changed hands between various collectors, currently it is in California awaiting restoration. 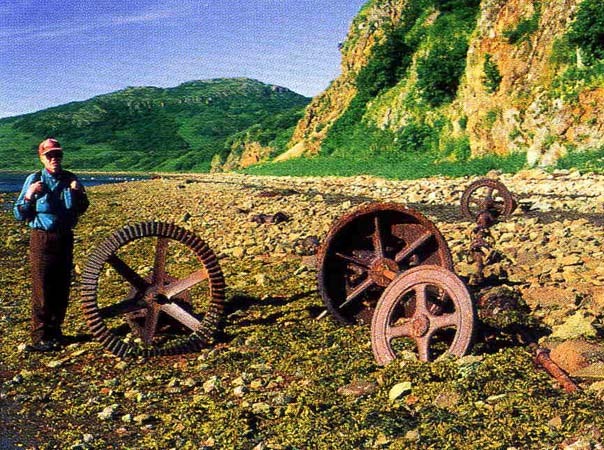 The Apollo Consolidated’s relatively short route is just one example of the many industrial and mining lines operating in Alaska during the late 19th and early 20th century. While this line is sometimes referred to as the “westernmost railroad in Alaska”, there were actually several nearby railroads and trams contending for this title, including the Choumagin Mine and a short railroad at Herendeen Bay with a small steam locomotive. These small but fascinating railroads demonstrate the pioneering spirit and ingenuity required to build and operate infrastructure in a remote, rugged environment. Bibliography Alaska ShoreZone Coastal Mapping and Imagery. NOAA Fisheries, n.d. Web. 03 Aug. 2013. Bailey, Douglas C. "Apollo Consolidated Mining 0-6-0T – A Quest Complete" The Webmasters Blog. Steamlocomotive.info, 14 Dec 2012. Web. 01 Aug. 2013. Clifford, Howard. Rails North: The Railroads of Alaska and the Yukon. Seattle, WA: Superior Pub., 1981. Print. Higginson, Ella. Alaska - The Great Country. 367: Macmillan, 1912. Web 02 Aug 2013. United States. Department of Commerce and Labor. Delarof Harbor and Entrance, Alaska. By J. B. Miller. N.p. : n.p., 1913. PDF. United States. Geological Survey. F.R. Brown's Report; Apollo Consolidated Gold Mining Company. By F. R. Brown. N.p. : n.p., 1947. PDF. MR-138-01. Tagliabue, Fancis. "Plat of the Claim of Sitka Consolidated Mining Co known as the Sitka Consolidated Quartz Claim and Mill Site" Map. Mineral Survey #297A&B / MS 298. District of Alaska: US Surveyor General's Office, 28 Jun 1899. Porter, Orville. 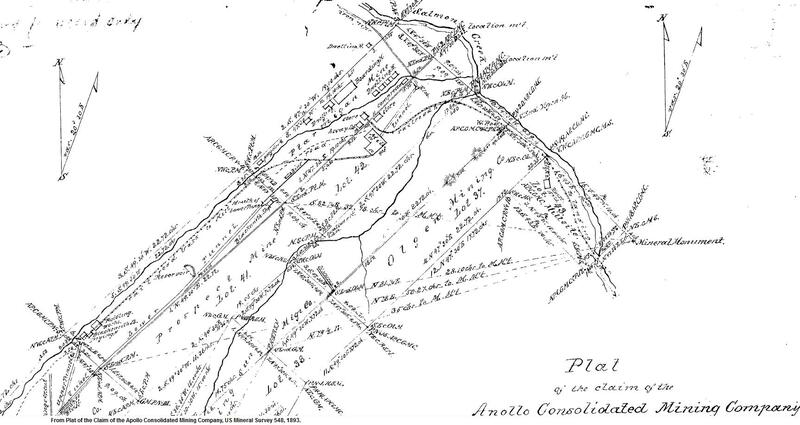 "Plat of the Claim of the Apollo Consolidated Mining Company upon the Apollo Consllidated Mining Claim and Mill Site" Map. Mineral Survey #7 / MS 548A&B. District of Alaska: US Marshall ex officio US Surveyor General's Office, 1894. The Route of the Apollo Consolidated Mining Company for Google Earth. Collected Apollo Mining Co. Photographs. The locomotive was later salvaged and has changed hands between various collectors, currently it is in California awaiting restoration. Nearby points of interest included the town of Unga, which now appears abandoned, a cannery, and various other fishing stations. Same view in 2004 (from this page). From “Department of Redundancy Department“, photos used in Alaska Geographic.